The Threatened Species Index (TSX) has begun life as a research project of the National Environmental Science Program’s Threatened Species Recovery Hub. 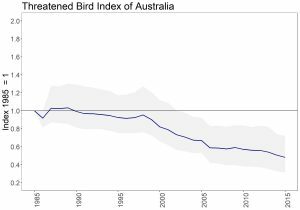 In the first phase, we have focused on building a Threatened Species Index for Australian Birds (TBX), in collaboration with Birdlife Australia. In 2018, the first TBX indices have been produced for Australia and for each Australian state and territory. The data underpinning the generation of the indices can be used to generate indices for a range of taxonomic groups through the TSX web visualisation tool. Indices presented in the tool are best interpreted in the light of the quantity and consistency of underpinning data, as shown in the tool. More information on understanding and interpreting the trends is provided here.